The cold is here to stay. This week will be our most winter-like so far this year. Weren't we just melting in 105 degree heat? That's only a dim memory now. And when the temperatures drop, the fiber comes out to play. Fiber, and fiber friends. Meet Madeleine and Anna - new shareholders and relatively new spinners. Madeleine has nine talented kids, each gifted in some crafting area. Anna's the fiber girl. She and her mom made a long drive over to the farm Saturday to see the place, meet the critters, and get some advice on a free spinning wheel they'd been given. Turns out it's an old Schacht Matchless - not a bad gift! It mostly needed a bit of oil and a little tweak or two. 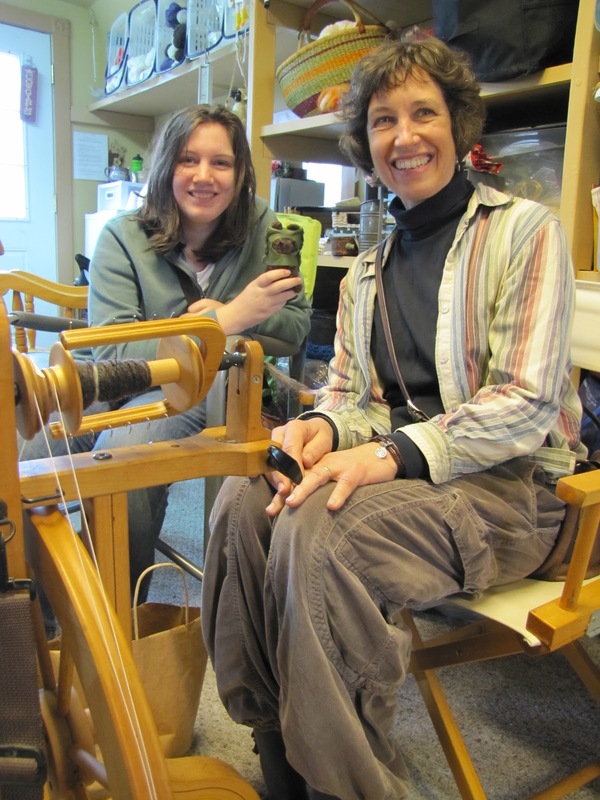 Young Anna is a fine spinner, both on a spindle, and now on this new wheel of hers. 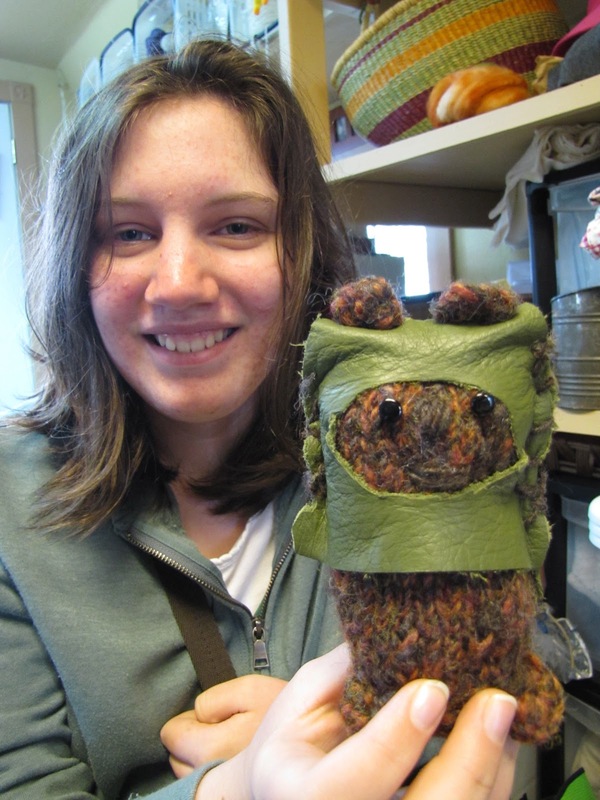 One of her first projects is a spindle-spun, hand knitted Ewok she made herself. Isn't he delicious? I cannot wait to see what comes off her needles next. 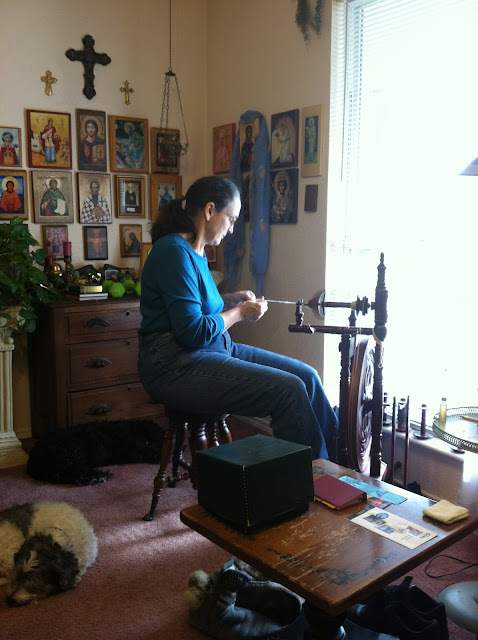 Today I went over to see our new friend Elaine, also new to her Kromski wheel, but progressing like mad. We had such a great time spinning, baking bread and talking about how we'd like to be peasants when we grow up - living and cooking simply, enjoying our archaic crafts. Sometimes a life of hard labor sounds like it would be a vacation from our lives tormented by technology and modern pressures. Okay, maybe not, but it's fun to dream. UPDATE: The Help Shares we introduced Saturday filled up to overflowing. I finally had to cut off applications at 12 wonderful new shareholders. These ladies have committed a BUNCH of valuable people-hours of help to the farm. I can't tell you what a gift that is. REMINDER: Shareholders past and present, Whole, Half or Help: please RSVP if you're planning to come to this Saturday's annual Christmas Shareholders' Tea at the Little Red Barn. Fun and food... 'nuf said. 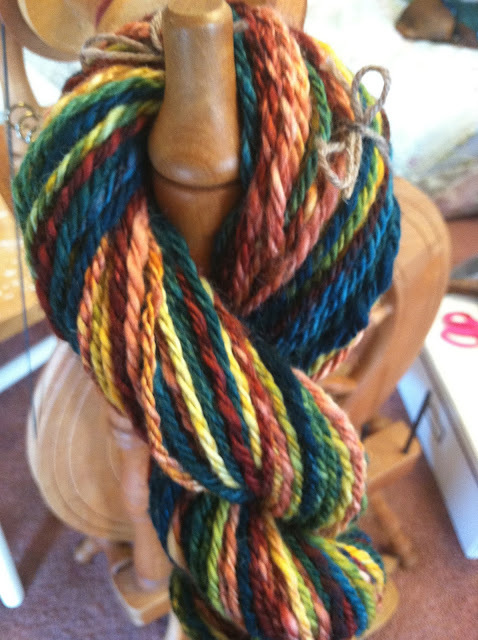 A special welcome to the new knitters!